Christian Thielemann has long been associated with Bruckner, and his current discography includes 25 recordings of Bruckner symphonies, with various orchestras and labels. But up until now he has avoided the earlier symphonies, with only a single recent account of the Third, and none for the four that precede it. Unlike his previous Bruckner recordings with the Munich Philharmonic, this set with the Staatskapelle Dresden is shaping up to be a complete set, so the time has come to address these early scores. If you have been following this cycle, which now includes Symphonies Nos. 1, 4, 5, 8, and 9, you’ll know what to expect. The Dresden orchestra performs in an ideal eastern German style, with nasal horns and a woody but resonant woodwind tone, all over a lush but timbrally complex bed of strings. Thielemann conducts from memory, and looks completely obsessed with the music. He conducts with small, emphatic gestures, with glancing cues and few downbeats. Even so, there is never any doubt that he is in complete control. The camerawork is mobile, with close-ups of the soloists—the excellent first horn gets a starring role—and plenty of Thielemann himself. The recording was made live at the Gasteig in Munich, not as picturesque a venue as their home at the Semperoper, used in previous installments, but it offers good sightlines and the audio is excellent. My only complaint is with Thielemann’s approach, which is grand and imposing, on the same scale as his readings of the later symphonies. The First Symphony isn’t a small-scale work, but it is more modest than the Seventh or Eighth, and while it shares their style of symphonic discourse, it needs a lighter touch. Thielemann’s heavy and overtly symphonic approach works well in some passages, particularly in the Scherzo, which has real punch, and much of the Finale, but elsewhere feels overblown. The Adagio in particular is too emphatic, too architectural and lacking in melodic flow—when the camera turns to Thielemann’s face, his stern expression and furrowed brow seem to be etched on to the music. But this is how Thielemann always approaches Bruckner, and everything else, so it shouldn’t come as a surprise. Just one last grumble: If Thielemann is going to take this approach to the First Symphony, then why not use the Vienna version? For the revisionist school of Bruckner performance, the conductors who favor fleet tempos and light textures—Schaller, Janowski, Venzago—the Linz version of the symphony makes perfect sense, but the more polished and cosmopolitan later version would seem a better fit for Thielemann’s approach. The musical world still hasn’t forgiven Bruckner for setting aside his Ninth Symphony to revisit the First, so his final version seems destined to remain a rarity on disc. This review appears in Fanfare magazine issue 42:1. 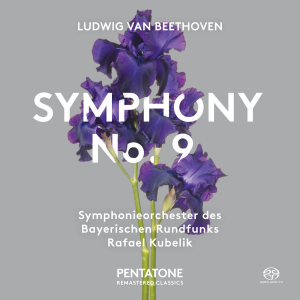 Rafael Kubelík famously made a complete Beethoven symphony cycle with a different orchestra for each symphony, but for the Ninth he returned to his home base, the Bavarian Radio Symphony Orchestra in Munich. By 1975, when this recording was made, he had been the orchestra’s chief conductor for 14 years, and that close relationship is clearly apparent here. Kubelík leads a dynamic but majestic account, old-fashioned perhaps, but compelling on its own terms. Kubelík never lets a phrase go by without inputting some subtle nuance of phrasing. Yet the results never feel micromanaged or overly detailed. Instead, each movement flows as a single paragraph of music. There is plenty of drama too, the climaxes thundering, and no less emphatic for their careful preparation. The slow movement is classic Kubelík, deeply Romantic and carried by the long melodic lines, again always carefully shaped, but without impeding the music’s natural flow. Things come slightly unstuck in the finale. In the earlier movements, the controlled but charatcterful woodwind is a defining feature of the orchestral profile. But Kubelík pushes the players too hard at the opening of the finale, and the clarinets play sharp. Soloists and chorus all sing well, but Kubelík’s pacing in the last few minutes lacks the intuitive logic that he applies earlier on, with problematic tempo shifts between sections and hesitant delays before the final choral entries breaking up the flow of the music. For a few moments, Beethoven’s tenuous formal logic seems to get the better of him, a surprise given Kubelík’s usual gift for making less coherent works sound perfectly proportioned—just think of his early Dvořák symphonies, and especially his recording of Pfitzner’s Palestrina. Two other recordings of Kubelík conducting Beethoven’s Ninth have also been reissued in recent years, another with the BRSO on Orfeo and one with the New Philharmonia on BBC Legends. The version at hand was made for Deutsche Grammophon, who have released it several times, in 1999 as part of a two-disc set with Nos. 7 and 8, and more recently in box sets of the complete Beethoven symphonies and of the complete Kubelík DG recordings. This new release from Pentatone is significant because it offers the original four-channel quadraphonic sound. The sound is spectacular, and well worth Pentatone’s efforts, which apparently involved sourcing the original tapes and remastering them with the help of the original sound engineers. Four channels rendered into SACD surround means that the center channel is engaged but silent. The rear channels carry more of the orchestral sound than in modern surround recordings. Even so, the audio profile places the listener well in front of the orchestra, and not within it. My rear speakers are too small to do the recording full justice, but even on a home cinema surround setup, the benefits of the quad audio are clear. The placement of the orchestral sections is particularly detailed, with the timpani often dominating the front right speaker, but never obscuring any of the other sections. For some reason, the chorus is very recessed, and the engineers have made little effort to bring them into the surround environment. The soloists are closer though, and are well balanced and naturally recorded. This is the 25th release in Pentatone’s Remastered Classics series of 70s quad recordings on SACD, with previous releases including most of the Kubelík Beethoven cycle—only the “Eroica” is currently missing. No doubt the experimental nature of the original recording project led to variable results, but on the strength of this release there is much potential here for today’s audiophile listeners. Recommended, then, for some classic Kubelík Beethoven, especially in the adagio, and for the excellent audio—not something I would expect to be writing about a recording made in 1975. Lovro von Matačić was well regarded as a Wagner conductor in the decades after the war, but few of his many Wagner recordings have made it to CD. 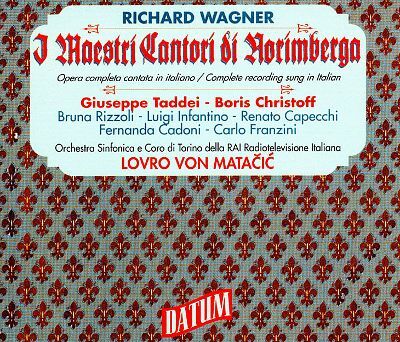 He worked closely with Wieland Wagner, and made several appearances at Bayreuth: A Bayreuth Lohengrin from 1959 is one of only two other Matačić Wagner recordings currently available (Orfeo 691063; there is also a 1957 Rienzi from Stuttgart, Archipel 555). The reason may be that Matačić was more active in regions without well-known Wagner performing traditions. My only previous encounter with his Wagner was a Lohengrin from the Teatro Colón in Buenos Aires from 1964. That one is a curiously macaronic affair: The leads sing in German while the chorus sings in Italian. It was released in 2010 on the Columa Música label (0229), presumably to capitalize on the impressive performances of Victoria de los Ángeles as Elsa and Christa Ludwig as Ortrud, but it’s no longer in print. The Italian character of this performance goes well beyond the language, with most of the cast, and the chorus too, performing in a style better-suited to Verdi or Puccini. There is lots of portamento, a generally free approach to rhythm, and lots of emphatic phrasing with big dynamic swells. Most Italianate of all is Infantino as Walther, a matinee heart-throb reading that takes some getting used to. But the presence of his voice, and elegance of his tone, right up to the top, make this an impressive and endearing performance. Similarly with Taddei’s Sachs. This is a dour reading, more stentorian than benevolent, but the tone is solid, and Taddei easily commands the sound stage. Christoff’s Pogner is more traditional—he would have been in his late 40s when this was recorded, so a younger Pogner than in most staged performances, but his voice is ideal, dark and authoritative, but not overly weighty or deep. The best performance here comes from Bruna Rizzoli as Eva. Perhaps it is the role that allows her to escape sounding overly Italianate, but her performance could sit easily in any German-language recording, and stand out for quality rather than style. She is well served by the recording too, which captures a sweet, broad tone with plenty of support. She has a pronounced vibrato, wide and slow, but it is applied with such natural ease that it is difficult to complain. A stern Beckmesser from Renato Capecchi highlights a potential problem with this recording, the lack of humor. Capecchi gives a dramatic reading—you feel his pain—but his set pieces, outside Eva’s window and his competition song, almost feel aggressive and lack the required lightness. But perhaps Matačić is as much to blame. Generally, his reading of the score is very fine, dynamic and elegant, and well co-ordinated with the singers. But it feels more symphonic than dramatic. For example, the Prelude to act III is done with great passion; it is emotive and reflective, and all beautifully proportioned. But you don’t get the switch in mood when David enters (Carlo Franzini, a solid performance, but he doesn’t sound young), it’s more a gentle transition. And the moment a few minutes later when David realizes he has forgotten Sachs’s names day again passes without the music registering the humor. Matačić also has an annoying habit of pausing briefly just before climaxes, again more a symphonic than a dramatic trait, although in all other respects his interpretation is a fine one. The orchestral strings sometimes lack coherence, and the large choir can be ragged too. Even so, this is an entertaining and distinctive reading of Meistersinger, and makes for an enjoyable couple of hours. The last time this recording was released was on LPs in 1984 by Melodram, which was reviewed by William Youngren in Fanfare 7:3. He listed the inevitable cuts to the score, describing act III as emerging “as something of a patchwork quilt.” The fact that act III here times in at 113 minutes (at least 10 minutes shorter than the modern norm), despite Matačić’s steady tempos, gives an idea of the issue. 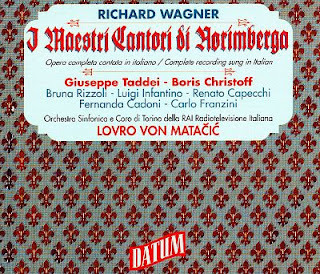 A lot of Sachs’s music is cut, which may disappoint Taddei fans, but otherwise it doesn’t seem like a deal breaker, especially as nobody—outside of Italy at least—is likely to be seeking an Italian-language Meistersinger for their reference recording. When Mark Elder gave a concert performance of Götterdämmerung in 2009 with the Hallé, he was non-committal about the idea of a full Ring cycle. When interviewers pressed him, he would emphasise just how much work the final part of the cycle was for the orchestra, with far more preparation required than a standard subscription concert (though it was spread out over two evenings). But the whole enterprise was such a success that the full cycle did in fact take place, with each instalment later appearing on the Hallé’s own label: This Rheingold has been released to coincide with the final concerts in the cycle, Siegfried in June 2018. As in the previous releases, this Rheingold is all about the orchestra, that much is clear from the packaging. On the back of the box is a quote from the London Times review, “the Hallé were the stars, responsive to every nuance of Elder’s direction.” Similarly, an orchestra list appears prominently in the otherwise skimpy booklet. There is a cast list there too, but it is the same font size as the orchestra players’ names (though bold), with no bios. The good news is that the Hallé players more than justify their billing, and are indeed the stars. Everything about this performance speaks of meticulous preparation, and the orchestra is on top form throughout. Particularly satisfying are the low woodwind and brass, well represented in the atmospheric and broad soundstage elicited from Manchester’s Bridgewater Hall. Elder’s tempos are slow, so slow that the recording stretches to three CDs. He seems to be going out of his way to give the orchestral players the space they need to create the textures and atmosphere, which they do, and admirably. 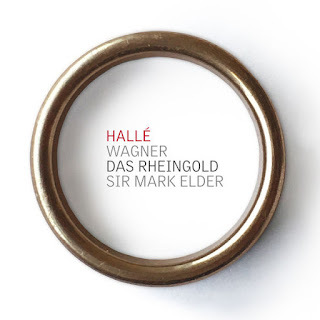 And although this is a slow Rheingold, it is more about detail than grandeur, with Elder maintaining a sense of narrative, even in the concert hall. That said, it occasionally feels like he is focusing the drama in the orchestral interludes, some of which begin with an ungainly gear shift, as if Elder feels he is no longer burdened by the singers and can get back to his orchestra. Fortunately, the singers never sound in need of further attention from the podium. The predominantly British cast makes for a good ensemble, and there are no weak links. Iain Paterson is lyrical but commanding as Wotan, offering an ideal balance of elegance and drama. Samuel Youn plays Alberich straight, with none of the dark comedy often associated with the role. The result is very musical, though arguably lacking in characterization. Nicky Spence is more theatrical as Mime, and more entertaining for it. Fasolt and Fafner, Reinhard Hagen and Clive Bayley, are suitably menacing, and easily distinguished for Hagen’s lighter, more lyrical tone against Bayley’s heft lower down. The female leads are harder to distinguish, apart from the sweet-toned Emma Bell in the criminally small role of Freia and Susanne Resnark as Erda, her appearance a great coup de théâtre, the sort of thing that Elder does well. This is a solid Rheingold, and competitive with any of the recent concert versions: Janowski, Gergiev, Rattle, Zweden. Among those, I’d probably rank Elder second, after Rattle’s excellent version with the Bavarian Radio Symphony Orchestra. All are lacking theatrical impetus, a fact that Elder, like Jaap van Zweden with the Hong Kong Philharmonic, seems to emphasize through tempos. Elder is also similar to Gergiev in his emphatic treatment of the orchestral interludes, though Gergiev takes that even further, increasing the drama but risking the coherence. Early reports suggest that Elder’s Siegfried is in a similar vein, steady but dramatic, with a strong cast, again including Paterson as Wotan. The CD release is no doubt imminent, and much anticipated.